Estimate Packing Time for Your Move | Cummings Moving Co.
Why does it seem that the last 10% of packing can seem like 90% of the job? When estimating the time it will take to pack your apartment, condo or home, you always want to err on the side of more time than you think you’ll need. Even if it seems like an outrageous amount, better to plan to have the time available than be caught short on time when you really need it. So how can you estimate how long it will take to pack your belongings? We are glad you asked – because THAT is what this post is about. From those intent on packing themselves to those who see the wisdom in hiring a professional to pack their belongings, the bottom line is getting your items packed up in a way that allows for safe transport to the new location. As human beings, we are generally optimistic about our ability to accomplish certain tasks. What we often forget is that there are all sorts of little things that add up over the course of the packing process. And if we are not careful to leave a buffer, we can get stuck needing more time than we budgeted. Things like running out of packing supplies, the added time to label things properly and pack things well. The time it takes to find used boxes or tape new ones together. The time it takes to move and stack packed items so the boxes are out of the way and still easy to access come moving day. Method 2 – Figure out how long it would take to pack ONE average box – start to finish – Include taping the box together, wrapping the contents, packing the box full, taping it shut and labeling the contents on the outside (top AND end). Then, if you are good at mentally calculating volume, walk around your entire home and estimate how many PACKED boxes per room. Do the same for closets, attic/basement, garage, storage, etc. ADD the boxes together and add 20% to the total (just in case). Then, multiply the number of GRAND TOTAL number boxes by the time per box. Take the total time and add 20% more time to it. NOW you have an approximate number of boxes AND the rough time you will need to pack them! Method 3 – Unless you have moved several times or are one smart cookie when it comes to estimates like this, it may even take you more time than you calculate. If you can, it makes sense to pay a professional to pack your house for you. Professional packers are both fast and efficient. They pack your belongings with care and understand how to pack for efficient loading of the truck on moving day and for the safety of your belongings while in transit. As soon as you try a whole house packing service, you’ll see what we mean! 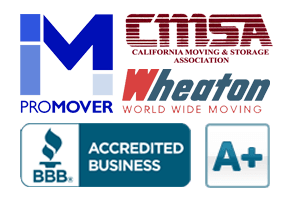 For a quote on packing as part of a move with Cummings Moving Company, request a Free Moving Quote.